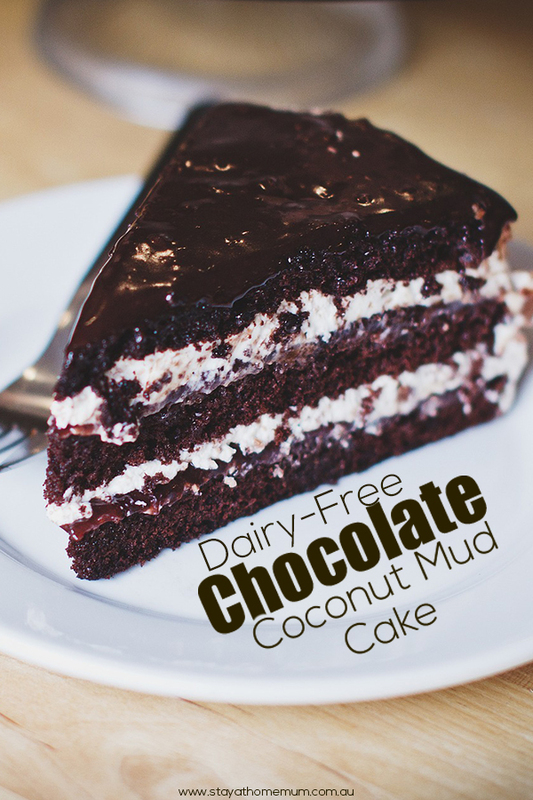 Dairy-Free Chocolate Coconut Mud CakeDeliciously Dairy Free! Dairy-Free Chocolate Coconut Mud Cake is a deliciously wicked cake. So good, you’d never know it was dairy free! And the best part is, this Dairy-Free Chocolate Coconut Mud Cake is just as rich even with the swapped ingredients! For a dairy free filling try our Whipped Coconut Cream! Line a round tin with baking paper and set aside. Set up a double boiler with a medium saucepan half filled with water and a metal bowl on the top. Add half the chocolate and the coconut milk together in the bowl and stir until the mixture is melted and smooth. Add the sugar, sifted flour, baking powder and vanilla extract and beat with an electric hand beater for a couple of minutes or until well combined. Pour into the tin and bake for 35 minutes or until a skewer comes out clean. Turn carefully onto a wire rack to cool. Heat the remaining chocolate and coconut milk in the double boiler and again stir over the heat until smooth. Pour the chocolate sauce over the cooled cake and serve. Dairy Free Chocolate Coconut Mud Cake is not suitable to freeze.